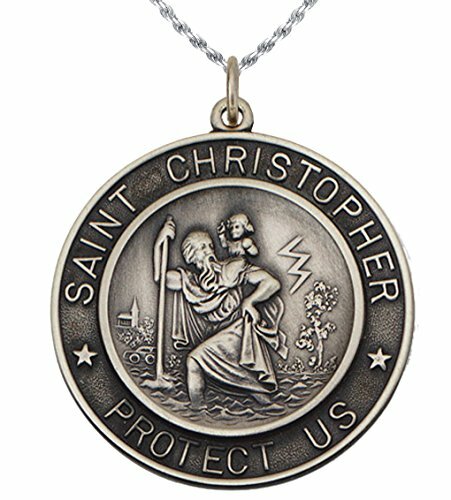 A brand new antique finish 0.925 sterling silver Saint Christopher 1 1/4in medal round pendant. Available in many different styles and sizes in both high polished and antique finishes so please visit the store for more options. This pendant features a picture of St. Christopher carrying Christ across a raging river and has the words "Saint Christopher Protect Us". Saint Christopher is the legendary patron saint of travelers, invoked as protection against danger, storms, and plagues. Makes a perfect gift for any occasion! We have a huge selection of solid gold or sterling silver jewelry including hundreds of pendants, rings, bracelets and earrings. Please visit the store for more options! SIZE AND MEASUREMENTS: Medal pendant is 32.5mm in length and 32.5mm in width. Size comparison - US Dime: 17mm, US Nickel: 21mm, US Quarter: 25mm. Take a look at the sizing image for more details. CHOICE OF CHAIN: Our pendants comes with your choice of a sterling silver 2.3mm, 3.3mm rope chain, a 2.2mm box chain, a 2.0mm, 3mm curb chain, a 1.5mm bead chain, a 3mm Figaro chain or a 3.3mm cable chain in either 18in, 20in or 24in sizes. (Custom lengths are available upon request). All chains are made of solid 0.925 sterling silver with a coat of anti-tarnish plating applied to ensure the highest quality and the longest lasting endurance possible. New Large 2in 0.925 Sterling Silver Ornate Cross Religious Pendant 3.0mm Figaro Necklace, 20"
1.25" Solid 0.925 Sterling Silver and 14k Gold Crucifix High Polished Pendant 3.0mm Figaro Necklace, 24"
New 1 3/8in Solid 0.925 Sterling Silver Industrial Style Cross Pendant 3.0mm Figaro Necklace, 18"
New 0.925 Sterling Silver 1.375" Oval Miraculous Virgin Mary Antique Finish Pendant 3.0mm Figaro Necklace, 18"
New 0.925 Sterling Silver Lobster Crab Pincher Claw Aquatic Pendant 3.0mm Figaro Necklace, 24"
New 0.925 Sterling Silver Christian Catholic Cross Charm Pendant 3.0mm Figaro Necklace, 18"
1 1/2in Solid 0.925 Sterling Silver High Polished Cross Pendant 3.0mm Curb Necklace, 18"
1 3/8in 0.925 Sterling Silver St Saint Christopher Medal Pendant 3.0mm Curb Necklace, 20"